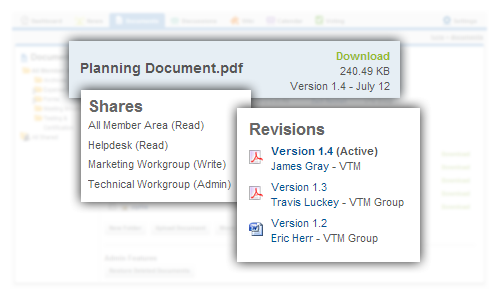 The documents library allows committee members to upload, share, comment and collaborate on documents and files of any type. The interface makes it easy to keep track of multiple versions of a document, and provides the ability to collect and organize comments on a draft document that is under development or up for review. The ability to post content to the library can be opened to all workgroup members, or limited to chairs and administrators based on the committee chair’s preference. Documents can also be shared from workgroup to workgroup with read-only or full editing rights, or made publicly accessible for linking on a website or blog. Causeway helps keeps members informed by allowing individuals to check a box to send a message to the workgroup each time a document is updated.